Is it time for the University of Utah to take over Fort Douglas? 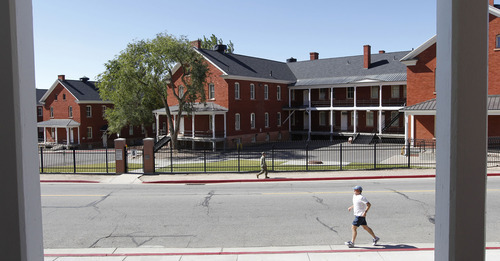 Military • U. of U. could finally take control of the remaining 51-acre piece of historic fort. 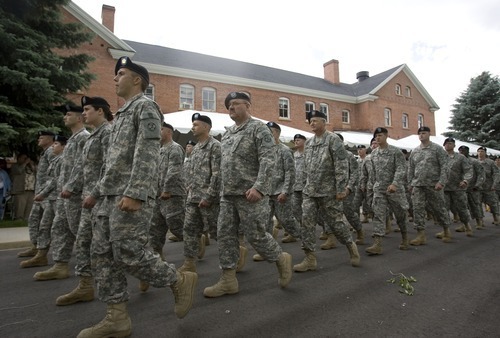 Tribune file photo Soldiers of the 96th Regional Readiness Command, which has since been shut down, march in October 2010 to the parade grounds at Fort Douglas. The University of Utah has long hoped to move into the Army's last 51-acre holding in the historic fort -- a move now suggested by Utah Sen. Orrin Hatch. Al Hartmann | The Salt Lake Tribune Runner jogs along Fort Douglas Blvd as army soldier walks along the fenced section of Fort Douglas Wednesday October 3. The last section of Fort Douglas is being squeezed by dormitory housing to the east and the campus to the west. A century ago, the U.S. Army was the major presence in Wasatch foothills below Red Butte Canyon, and the University of Utah was a tiny collection of buildings arranged in a semi-circle. The two institutions have long since reversed their footprints. As the U. expanded east to become a major research university, the Army shrank its presence at the once-formidable fort established by President Abraham Lincoln on 2,500 acres in 1862. The U. has long hoped to move into the Army's last 51-acre holding in historic Fort Douglas  a move Utah Sen. Orrin Hatch is now trying to expedite. The fort formally closed as a military base in 1991, but close to 400 people still work in its century-old buildings  headquarters staff for two Army Reserve commands, and staff from other Army, Navy and Marine Reserve units. Hatch believes he has an idea that could help the university expand without compromising military readiness or tapping taxpayers. Federal law allows the government to raise money by renting under-used public property to developers under an arrangement called an Enhanced Use Lease, or EUL. Hatch has suggested the U. and the Army sign an EUL, letting the U. lease the Army's last Fort Douglas holding while the Army uses the revenue to build or lease facilities elsewhere. "My goal is to make sure the University of Utah has sufficient room to expand, while simultaneously ensuring Utah's Army Reserve units have modern facilities to support their vital missions," Hatch, R-Utah, said in an e-mail. "We've been in communication with the Army Reserve and University officials about this and we're going to continue to work together to find a solution that works for everyone." The office of Rep. Rob Bishop, R-Utah, said moving the two Fort Douglas Reserve commands to Hill Air Force Base could be a good way to ensure they remain in Utah and help keep Hill off the hit list for future base closings. Bishop's office said estimates from various sources suggest it would cost $60 million to $80 million to build replacement facilities. Activities related to the commands and the units are estimated to generate about $160 million in economic activity in Utah, and they require 500,000 square feet of administrative space and 22 acres for equipment storage, the office said. While the Army Reserve's 96th Regional Readiness Command was being closed down at Fort Douglas in 2009, headquarters staff for two far-flung two-star commands moved in. They are the Joint and Special Troops Support Command and the 807th Medical Command, which oversee more than 20,000 Army Reservists located across the country. Staff for those commands and the other Reserve units are housed in historic buildings above Mario Capecchi Drive north of Wakara Way. Army Maj. Gen. Daniel York, who heads Joint and Special Troops Support, said the proposal is too preliminary for him to comment. The 96th's former commander, Peter Cooke, now a Democratic candidate for governor, was instrumental in bringing the 807th to Fort Douglas, with help from Hatch. "These are huge commands. It's a feather in our cap to have two here. It's one of the cheapest and smartest ways to keep a ready force in our country," Cooke said. "We need to keep those commands in Utah. We don't want to send a message that our state is not concerned." Cooke, who has made safeguarding Utah's military assets a centerpiece in his bid to unseat Gov. Gary Herbert, said he explored moving the Reserve commands to Hill when he was still the commander. Moving to Hill would pose a problem to the many reservists who live in or near Salt Lake City, he said. "It didn't make sense to move reserve units. It didn't fit the demographics. The headquarters need to be population-based," Cooke said. The U. has already taken over most of the fort's land, covering it with residential, medical and research buildings. It developed the east side for student housing, which doubled as the Olympic Village for the 2002 Winter Games, and took costly steps to preserve and retrofit numerous structures. Students and interdisciplinary academic programs now occupy many of the 19th-century sandstone and masonry houses near the tree-lined parade grounds. The fort's park-like core is listed as an historic district on the National Register of Historic Places and it remains home to a military history museum. The U. 's eventual ownership of the last piece of Fort Douglas is envisioned in federal law. Nearly 20 ago, Utah's congressional delegation championed legislation that requires it to be transferred  at no cost  to the U. once the military deems it surplus property. The most logical use of the property is adding it the U. campus, according to Jake Garn, the retired Utah senator who introduced the bill. "I wanted to give the whole thing to the university. You don't need every square inch for the Reserve," said Garn, who served for two decades as a pilot in the Air National Guard and drilled at Fort Douglas as a junior Naval officer in the 1950s. An EUL could speed the process of the U. taking over, by allowing the military to keep the title while generating revenue for relocating its Fort Douglas units. Such an agreement enabled the U.S. Air Force to lease 550 dormant acres of Hill Air Force Base to developers for Falcon Hill, an industrial park now under construction in Layton. U. officials stressed they are not driving the proposal, although they would welcome gaining access to the acreage. It could be an ideal place to develop student housing and move peripheral services from central campus. "Defense is important to everyone. We want to be sure the [military] units are appropriately housed and sited. The question of what is the best site is something the Army Reserve has to decide," said Fred Esplin, the U. vice president for institutional advancement. The remaining portion serving the Reserve commands features seven U-shaped barracks, known as Soldiers Circle, built in the first part of the 20th century. "We desperately need to upgrade our married student housing. Would that be an appropriate site? Perhaps," Esplin said. "We would have to study this carefully and we haven't yet." Because of the historic nature of the barracks, the U. would be obliged to preserve them, which would require seismic retrofits and major renovations. The polo field framed by the barracks would be preserved as open space, but there are about 10 acres where new buildings could be located.